A contentious proposal to link oversight of California's electric grid with other states in the U.S. West narrowly cleared a legislative hurdle Tuesday, keeping alive a proposal that has divided environmentalists over the best way to expand renewable energy. California has greatly expanded the use of renewable energy sources, particularly wind and solar, but that's brought new challenges for grid operators to manage supply and demand as weather patterns and sunlight vary. California at times has excess solar power that must be offloaded to other states, which are sometimes paid to take it so the grid doesn't get overloaded. Other times, natural gas power plants are fired up to keep air conditioners humming as the sun goes down. Proponents of a regional grid say improving cooperation across the West would make it easier to use renewable resources from other states to meet demand in California, and vice versa. They say it would lower costs for consumers by reducing the need for spare power-plant and transmission capacity. 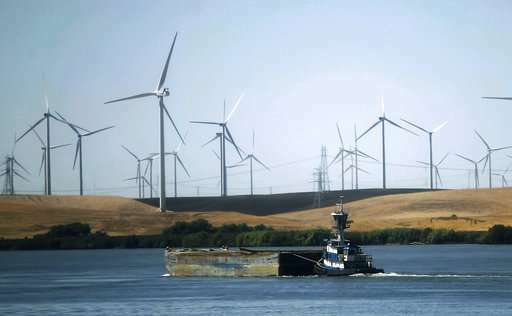 "If California is truly committed to a high renewable energy future, the truth is we need to start doing things differently," said Laura Wisland, senior manager for energy at the Union of Concerned Scientists. But critics say that same infrastructure could be used to boost demand for natural gas or coal power produced elsewhere. They worry that Trump's efforts to revive coal plants, which are seeing declining demand, would require Californians to buy coal power. "The risks simply aren't worth it," said Matthew Freedman, staff attorney with The Utility Reform Network, an advocacy group. The state has other options to improve western cooperation without ceding control over the grid operations, he said. There are also concerns the plan would eliminate jobs. Several unions representing renewable energy workers say electric capacity could shift to neighboring states with cheaper land and labor. The idea for a regional grid, which was first proposed in the 1990s and shelved during the state's energy crisis, re-emerged several years ago. It was the subject of a fierce lobbying push in the final days of the legislative session last year but never got a vote. It cleared the Senate Energy, Utilities and Communications Committee with the bare minimum votes needed to pass Tuesday, even as two Democrats said they had deep reservations and may vote against it at a later stage. The measure requires support from two more Senate committees before advancing to the full Senate and Assembly. The Western grid includes 38 so-called balancing authorities that match the power supply with demand in states west of the Rocky Mountains. It's unclear how many other states have grid operators that want to link with California's. Washington Gov. Jay Inslee wrote a letter supporting California's legislation, saying his state's abundant hydroelectricity can contribute carbon-free energy to the market. "This bill will help Washington and California meet our clean energy and climate protection goals," Inslee, a Democrat, wrote. If California's legislation is approved, state utility regulators would need to sign off on individual utilities looking to link with the regional grid, but most states would not likely require legislative action, said Curt Zichella, director of western transmission for the Natural Resources Defense Council, which supports the legislation. "This is the same bag of goods that was sold to Californians in the late 1990s, when Enron swooped in and took advantage of this speculative market," said Jaimie Court, the group's president. The bill is AB813 .